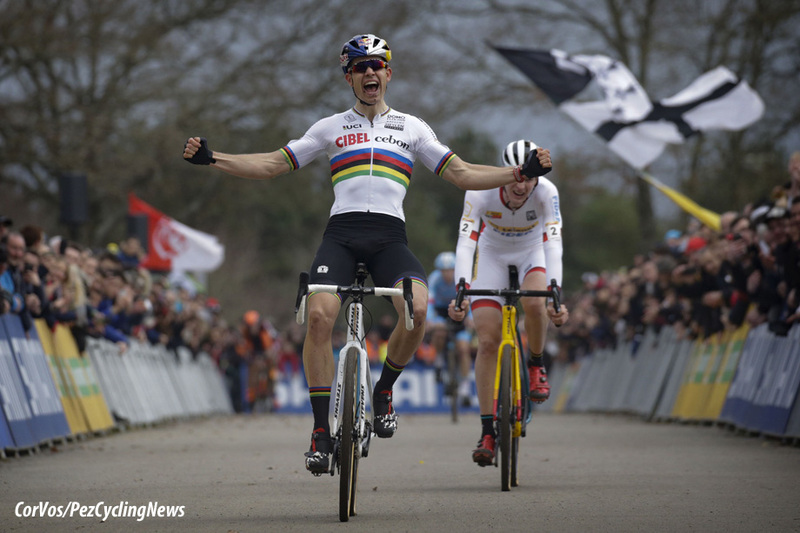 The 2019 season is well under way and Richie Porte took his sixth Willunga Hill victory and Daryl Impey his second Tour Down Under overall win - Results and video, plus Wout van Aert wins a cyclo-cross. Careful how you use your GPS - Top Story. Loads of other cycling news: Andrea Tafi for Roubaix? New kit for Greg Van Avermaet, André Greipel for Roubaix, Fabio Aru test results, Cofidis want WorldTour, Wanty-Gobert new performance branch, Sunweb extend contracts with Liane Lippert and Floortje Mackaij and Oz Cycle go on a ride with the Deceuninck - Quick-Step team Down Under. Get the coffee! TOP STORY: Big Brother is Watching You! Thanks to his GPS sports watch, a 'hired hit man' has been jailed for life in England for a double murder. Mark 'Iceman' Fellows was found guilty at Liverpool Crown Court of killing organized crime leader Paul 'Mr. Big' Massey and his associate John Kinsella. Liverpool police suspected Fellows in Kinsella’s death and it was his Garmin Forerunner that linked him to Massey’s murder in 2015. Detectives found a photo of Fellows in the 2015 Great Manchester 10K run wearing his Garmin, two months before the murder of Massey. The GPS data files recorded his stalking his first murder victim from his bike. The sports watch had recorded a 35 minute activity starting in Fellows’s neighborhood and traveling to a field near Massey’s home. The Garmin traveling at around 12 mph to a field, then dropped to 3 mph before stopping for about 8 minutes. According to police, this was the alleged escape route that Fellows used his bike two months later, after gunning down Massey in his own driveway. Three years later John Kinsella was murdered and along with surveillance video of Fellows making a reconnaissance in his car, he again used his GPS. On the day of the second shooting; Fellows used his mountain bike to murder Kinsella outside his house before making his escape on his mountain bike. Fellows was spotted riding away from the scene wearing commando gear, a hi-vis safety jacket and carrying a gun. Turn you GPS off if you are doing something you shouldn't be! Stage 4 of the Tour Down Under was won by defending champion Daryl Impey (Mitchelton-Scott). The 34-year-old South African took the sprint ahead of twenty riders remaining after the climb of Corkscrew Road. Overall leader Patrick Bevin (CCC) finished 2nd, adding seconds to his lead as Impey moved to 2nd at 7 seconds. Luis León Sánchez (Astana) was 3rd on the stage and is 3rd overall at 11 seconds. Six riders made up the break of the day: Benoît Cosnefroy (AG2R-La Mondiale), Thomas De Gendt (Lotto Soudal), Hermann Pernsteiner (Bahrain-Merida), Miles Scotson (Groupama-FDJ), Jasha Sütterlin (Movistar) and Nicholas White (UniSA-Australia). The CCC team kept the pace high for Bevin in the leader's jersey. When the maximum lead of the six was above 5 minutes, Astana and Mitchelton-Scott decided to help the chase, and with 50 kilometers remaining the lead was down to3 minutes. The race was waiting for the climb of Corkscrew Road with 10 kilometers to go. De Gendt and Scotson were the first to make a move, but it was Pernsteiner and Scotson stuck out on the climb. Rémi Cavagna tried to cross, but was caught by the peloton as Sky with Dylan van Baarle set the pace. When Pernsteiner and Scotson were caught it was Wout Poels who made a move for victory. Only George Bennett (Jumbo-Visma), Richie Porte (Trek-Segafredo) and Michael Woods (EF Education First) could go with him. Bennett was the first over the top with the other three on his heels. In the chase, Chris Hamilton (Sunweb) tried to cross, but failed. On the technical descent the leaders took chances to stay out front, but Lucas Hamilton (Mitchelton-Scott) brought everything back together just before the last kilometer. Twenty riders fought out the final, with Impey ahead of Bevin and Sanchez. 2nd on the stage and overall leader, Patrick Bevin (CCC): "That was a very tough day. I knew coming down the gorge, it was still a long way to the finish. The race didn't finish on top of the climb. It was really hard to stop us coming across in the downhill. I took the onus up as much as I had to on the descent. As that group got bigger it was at the point where if I could take any time bonus, it was good. Any is better than none and I wasn’t going to risk losing time to anyone. It was a bit unfortunate to come to the top with Daryl [Impey] but coming second on the stage and keeping the lead is kind of the best-case scenario for me. We as a team had a lot of help before because we told them we're not going to be the only team to work again all day. There are still two types of guys who can win the overall: the sprinters who can climb, Daryl is the first of them, and obviously, there's Richie [Porte]. From now on, for us, it's about managing both parties." "To give up four seconds to Daryl is a great result at the end of the day because I don’t feel like he is climbing better than I am and we put time into the pure climbers. It would be great to take more time tomorrow. That would be a real step towards the final day in Willunga because I’m still only 21 seconds over Richie before Willunga. It’s not a huge buffer. Fortunately, this race is about being an all-rounder. Basically, you have to sprint better than the climbers and climb better than the sprinters. For me, personally, this has been an opportunity to grow. Even the stage I won, had I had a Richie Porte or Rohan Dennis on the team then I probably wouldn’t have had the opportunity. I definitely wouldn’t have had the opportunity to sneak some time away on the first day. The team is racing totally different and it’s suiting me down to the ground. I really feel like I’m enjoying the way we are racing and the style of racing." 25th on the stage and overall, Gregor Mühlberger (Bora-Hansgrohe): "It was a hard stage. The six guys in the breakaway set a fast pace and that didn't make it easy for us in the peloton. In the end, it was up to the legs you had on the Corkscrew. At the beginning of the climb I wasn't very well positioned and I missed the front group. I gave my best, I tried to reach them but I wasn't able. I'm disappointed with the result today." 10. Dylan van Baarle (Ned) Sky. 10. Michael Woods (Can) EF Education First. 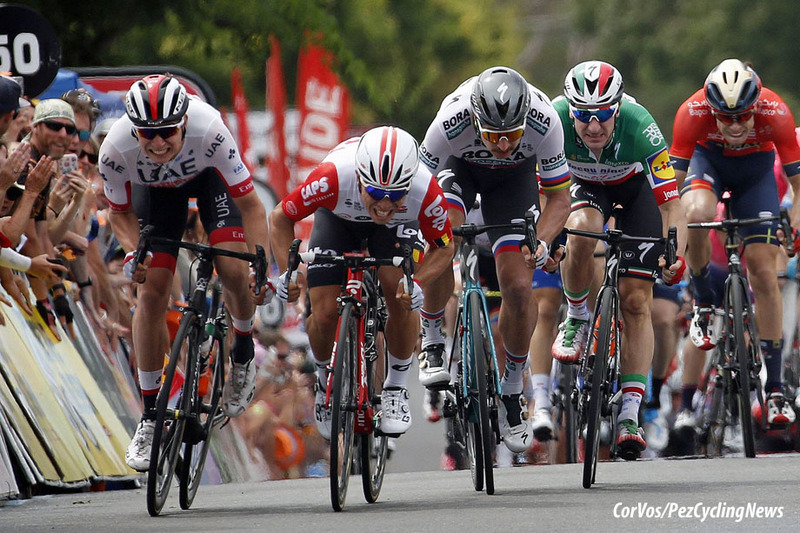 Stage 5 of the Tour Down Under went to Jasper Philipsen (UAE Team Emirates) after Caleb Ewan (Lotto Soudal) had crossed the finish line first, but was disqualified due to head butting in the last kilometer. Peter Sagan (Bora-Hansgrohe) finished second ahead of Danny van Poppel. After a bad crash, overall leader Patrick Bevin (CCC) made it back to the peloton, but needed X-Rays and had cuts to his right arm and knee and was holding his ribs. The first break came after only 2 kilometers: Ayden Toovey and Jason Lea were eventually joined by Clément Chevrier, they took a maximum lead of 3:30 in a short time. With about 135 kilometers to go, the peloton started a proper chase. In no time the difference was reduced to less than a minute, and then the peloton held them at 300 seconds for a long time. The group were caught before the first sprint of the day. Second overall, Daryl Impey (Mitchelton-Scott took the biggest bonus as overall leader, Patrick Bevin was second and Francisco Ventoso (CCC) third. With 74 kilometers to go; Mathieu Ladagnous (Groupama-FDJ) went solo and was joined by Toovey again, but they were caught after 40 kilometers. The wind got up and under the pressure of Sky and Jumbo-Visma the peloton split into echelons, but no one was dropped and when the course changed the race came back together. Just after the 10K to go banner there was a big crash with overall leader, Patrick Bevin, coming off the worst. Bevin needed a new bike and had to be helped to remount with injuries to his right side. With help from his teammates and a drop in the speed of the peloton, the New Zealander regained the bunch by the finish to hold his lead. Deceuninck - Quick-Step took over the lead-out work in the last kilometers for Elia Viviani, but behind them Caleb Ewan wanted to be on the wheel of Peter Sagan and using his head he pushed Jasper Philipsen of his wheel. Ewan came past everyone for the stage win, but the race jury thought otherwise and relegated him to last place on the stage, giving the 20-year-old Philipsen his first WorldTour victory. Upon crossing the line, Bevin was immediately taken to the race ambulance and transported to hospital for observation, where X-Rays and CT scans fortunately confirmed that there were no fractures, however Bevin sustained multiple contusions and bruised ribs and hip. Bevin will be observed overnight and will undergo a concussion test on Sunday morning to determine whether he is able to start stage six and attempt to defend his race lead. Stage winner, Jasper Philipsen (UAE Team Emirates): "It’s an important victory for me, my first WorldTour race, but it arrived in a strange way, so I missed that feeling of crossing the line first. Still, success is always beautiful and I’m very content to have taken it. The final, just like in the past days, had a lot of movement. There was a good fight for position and a crash, but I was in good position for the last curve. I feel that I have strength and spark, and like that I was able to realize a good sprint. Thanks to the team and the sponsors who wanted me and brought me into this team. And to all my team-mates for the contestant support that they gave these days." Overall leader, Patrick Bevin (CCC): "It was such a nervous stage and there was a battle for position all day. All it took was a touch of wheels and I went down. I’m pretty banged up right now but I really hope that I will be able to line up tomorrow. Fortunately, nothing is broken so we will see how I pull up in the morning." 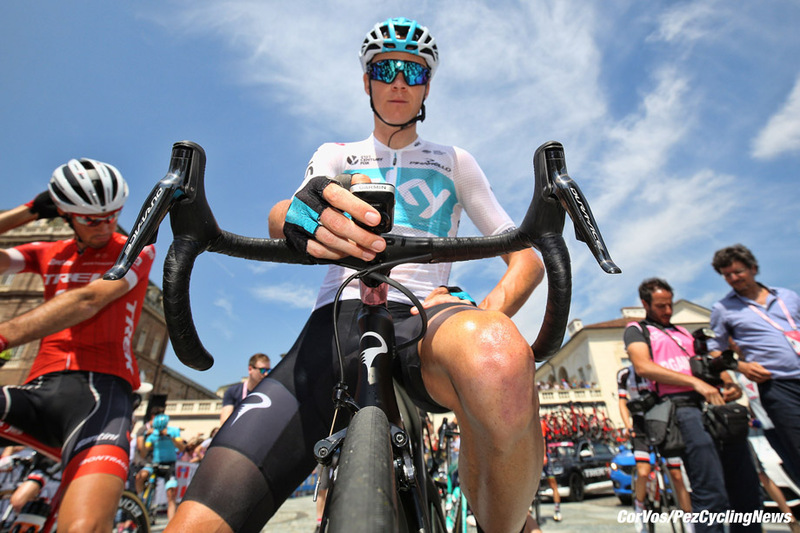 CCC Team doctor, Dr. Piotr Kosielski: "Patrick was taken to Calvary Wakefield Hospital in Adelaide where he underwent X-Rays and CT scans to determine his injuries. Fortunately, he did not break any bones and had no internal injuries however, he has extensive bruising and abrasions all over his body. Although the CT scan did not show signs of any head injuries, our main concern is concussion which is why we want to wait until tomorrow morning, when we will perform a concussion test, before making the final decision as to whether Patrick can line up tomorrow. We will continue to monitor his condition overnight." 2nd on the stage, Peter Sagan (Bora-Hansgrohe): "The day turned out as expected. The strong breeze stretched the peloton at times but in the end, we had a bunch sprint. I had good legs and went for the stage win but I was squeezed and couldn't make it. My form is good, the team did an excellent job today and we'll fight again tomorrow on the last stage of the Tour Down Under." 8th on the stage and 4th overall, Ryan Gibbons (Dimension Data): "Once again, not totally happy with the stage result. I was definitely hoping for more than 8th in the sprint but in that final kilometer I found myself too far back, with not much opportunity to move up. The young riders jersey is a great consolation though. It’s pretty surreal actually, if someone said i’d be in 4th place overall and in the white jersey heading to Willunga a few days ago, you would’ve said they are crazy. Now that we have the jersey, the challenge is to fight to keep it and place high on the overall, and secure some World Tour points." Relegated, Caleb Ewan (Lotto Soudal): "This is very disappointing. I was so looking forward to my first official victory for Lotto Soudal. After crossing the line, it felt like a massive relief, but the next moment all of that joy disappeared when I heard that I had been relegated. Nevertheless, the team did a great job today. It was a tricky and hectic day with a lot of wind. Before the stage, everyone knew that there was a possibility of echelons, but the team kept me in front all day long. I could also start the finale in a perfect position. During the final kilometers, I was on Peter Sagan’s wheel but Philipsen tried to take that spot as he tried to push me out of Sagan’s wheel. You are not allowed to take your hands off the handlebars in the sprint so I used my head to avoid ending up in the barriers. Head movements are of course clearly visible on a helicopter shot but a lot of former sprinters will confirm that my maneuver was not irregular. Of course, I have to accept the decision taken by the jury, but I don’t agree with it. I wanted to protect myself and the whole peloton against a crash. The commissaires did not listen to our side of the story before taking the final decision. It will take a couple of days to process the disappointment. Now, it’s mainly about finishing the Tour Down Under on a good note and focusing on new goals afterwards." 10. Davide Ballerini (Ita) Astana. 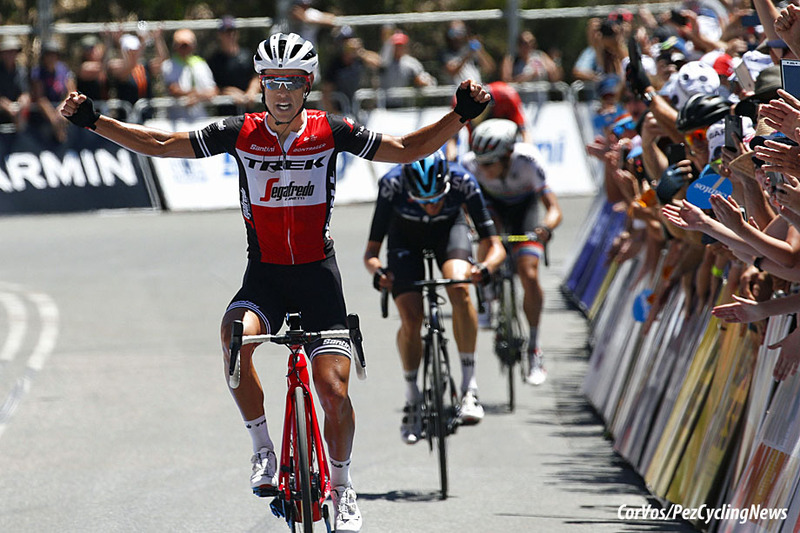 Richie Porte won the TDU Final Stage 6 to Willunga Hill for the sixth time on Sunday. The Trek-Segafredo team's new signing sprinted to victory at the top of the hill with Wout Poels (Sky) and Daryl Impey (Mitchelton-Scott) on his wheel. Race leader, Patrick Bevin (CCC) was suffering from his stage 5 crash and lost contact with the peloton on the climb, allowing Impey to take his second Tour Down Under overall win in a row. There was a strong early break of Jasha Sutterlin, Thomas de Gendt, Danny van Poppel, Alex Dowsett, Lukas Pöstlberger, Gediminas Bagdonas and Nicolas White, but with the main action to come, they knew they had no a chance of victory. By the first ascent of Willunga Hill they were caught. Sky duo Kenny Elvisonde and Poels attacked on the climb, but could not stay away. Overall leader Patrick Bevin (CCC) was suffering too much from his injury and had to sit up on the climb and give up his chance of defending the lead. Héctor Carretero, Daniel Oss and Tomasz Marczynski tried to escape on the run-up to the final climb, but they too were caught before the action started. At 1.5 kilometers from the finish, Porte put in his decisive attack. Poels and Impey managed to keep Porte in sight and pulled him back by the finish line. Porte won the Tour Down Under's Queen's stage for the sixth time as Impey doubled up on last year's overall victory. Stage winner and 2nd overall, Richie Porte (Trek-Segafredo): "It’s a hard race for someone like me to win, one hilltop finish and that’s it. But we came here with Trek-Segafredo – my new team – and the boys were absolutely fantastic the whole week, and they put me in good position again today. 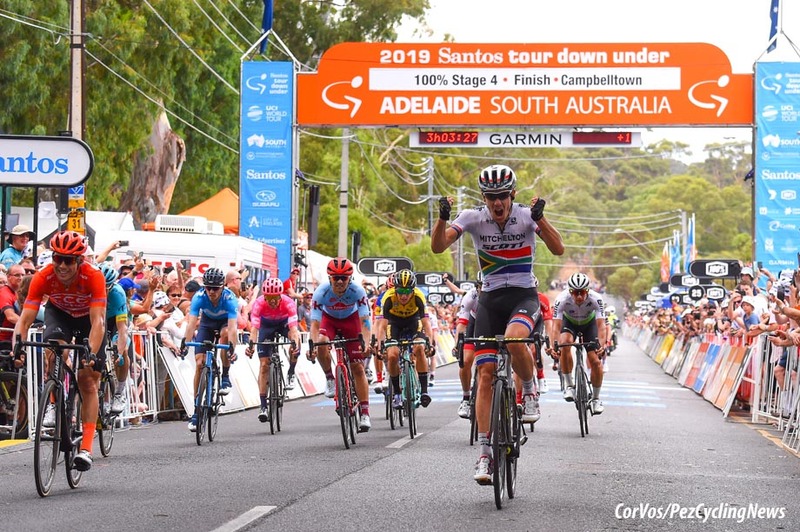 Hats off to Daryl Impey for the win, but to win six times on Willunga is a great feeling. The stage was probably easier for me than it ever has been because I was in a good position. But when Kenny Ellisonde did a fantastic ride there for Wout Poels, that was hard to have to take it up myself. I had to gauge my effort. To be honest, I thought I’d had it there, but when I heard (director) Kim Andersen on the radio telling me that everyone behind me was suffering too, it gave me a second wind. But I tell you what, the last 300 meters were probably the longest 300 meters, it really hurt. But it was a sweet victory. It’s always good to start with a new team, and they have faith in you like that. But here, you have to climb better than the sprinters, and then sprint better than the climbers – it’s not a race that really suits me. It did two years ago with the Paracombe climb as well. I think it’s just nice to get a victory, the team was absolutely fantastic out there today." 3rd on the stage and overall winner, Daryl Impey (Mitchelton-Scott): "I took the pressure but having the faith of the team goes a long way. We saw the boys committed right to the end. I couldn’t believe they (Porte and Poels) were that close so I just dug deep and went for it. That’s special to go back to back. I never dreamed to come here and win twice in a row. Every year we come here with strong ambitions. I knew the competition is always tough. I just believed in myself, and it was just fantastic to pull it off. Yesterday we really dug deep, and we took some valuable seconds. We knew we had some seconds on the climbing group. The stage win gave us a lot of momentum, and we started to believe we had a chance to win the race. The whole team rode great. The guys picked me up during the week. Last year I was a lot more ecstatic because I felt like I made a big step. I feel like I am maturing more as a rider, and that’s so exciting. I want to dedicate the win to him (Mathew Hayman). He’s been a fantastic team mate, a lot of my victories have come with Maty. To let him go out this way, we were going to celebrate his career anyway tonight, but to win the race overall it’ll be a double celebration." 2nd on the stage and 3rd overall, Wout Poels (Sky): "I’m disappointed. I think the team did really well, but Richie was strong today so it’s second [for me]." 4th on the stage and 5th overall, Rohan Dennis (Bahrain-Merida): "I am pretty happy. When you know that you are not the best at the moment you always aim for the best possible result. I even surprised myself with such good result today. I am happy with the week and it is a good start of the season with TBM and that is a great team and good start on the right foot. I really appreciated what my team-mates did for me and I looking forward going to Europe and all the upcoming races with my team." 5th on the stage and 4th overall, Luis Leon Sanchez (Astana): "First of all I would like to thank my team for a great support during the whole week and, especially, today. Honestly, I can be happy with the result which I’ve got here. All the week long I felt really good, I had a full support from my teammates and, in general, I did this race in the best possible way. On the short climbs I felt myself really good, also today I think, I climbed well, but maybe for me this climb was a little bit too long. I was coming here in Australia thinking about the podium as the main objective, but ok. I was close to that, finished 4th and I can be satisfied. I am happy that I started this year in a good condition, because the second part of the last season was damaged by a crash at the Tour de France. Now, I hope to recover a bit after a hard week and I am looking forward to the next race on Sunday." Sprint winner, Patrick Bevin (CCC): "I take the Ziptrack sprint jersey away from the race as a nice result for the week’s work. Obviously, it’s tough to touch down yesterday and watch my work evaporate on the GC but that’s bike racing. There are no guarantees. We take a lot of positives out of the race and look forward to the next one. I think someone must have told the crowd that I was Australian today as I had so many fans around the course. I had a lot of support. I had a great time here, an absolute blast coming here and racing from kilometer zero and I plan on sticking to that all year. I’m going to go out and scrap for everything all year. This race really only sets a precedent for what’s ahead. I’m a bit beat up, a bit sore. Crashes are a part of racing and it’s such a shame to do all that and have it come tumbling down. But, there will be another race and if nothing else, I’ll be back at the Tour Down Under next year ready to roll my sleeves up and box on again. I was very sore to start with and then I didn’t feel too bad once we got rolling. Honestly, I was entertaining the though of getting around. I had nothing to lose and I was going to go out and just hang on. But, we started fighting on the run up to the climb and I was in the red there, I was in trouble. I tried to regain my composure as we hit the climb and push on, but I couldn’t do it. It’s a pretty awful feeling to watch the race ride up the road. Until a lap to go, I kind of still thought I could win the race. I’ll be back here again going for the time bonuses and putting it to the little guys and we’ll see how it plays out next time." 12th on the stage and 11th overall, Ryan Gibbons (Dimension Data): "I gave it my all today and had nothing left in the end so it’s a real pity to miss out on a top 10 result by just 3 seconds. With a bit more experience I am sure I could’ve saved those 3 seconds somewhere out on the road but the key is to learn from this and take the positives with me, of which there are many. After not expecting to be anywhere near GC contention before the race started, I am relatively pleased with where I am at. With just over a kilometer to go today I was still very much in the game and that is really motivating. I am sorry I could not follow through today for the team, but to have them rally around me like they did, well that was a great experience and I think that sort of team work will take us far this season." Daniel Oss (Bora-Hansgrohe): "Although I had spent a good part of the day putting a strong effort, I felt I had the legs and I was with the select group in the first climb up Willunga. After we crested, I followed the move by Carretero and we formed a breakaway of three. I wanted to see whether I could stay ahead and help Jay and Gregor for the final climb but the group behind us was strong and closed the gap. I tried to make sparks fly in that final part of the race but the main GC contenders were strong and determined to keep everything under control." Overall team winners, Neil Stephens (UAE Team Emirates): "It was a beautiful result for UAE Team Emirates to get on the podium as the best team in the first WorldTour race of the year. Today we had more goals that we were after. We wanted to take the team classification but to try to be in the best possible spots in the individual classification. We achieved that considering that we have three riders in the top 15 of the classification, with Ulissi in the top 10. The great work that characterizes this group added up over the week. It’s an important factor that will show positively in the next competitions." Retiring rider, Mathew Hayman (Mitchelton-Scott): "I had very mixed emotions (up the final climb). I was off at the bottom by myself, having a bit of a wave and started getting a bit of a frog in my throat, and then all of a sudden my mind was back on to the race and how Daryl was doing. Next minute I had three teammates, (Alex) Edmondson, Heppy (Michael Hepburn) and Durbo (Luke Durbirdge) with me and it came over the radio that he’d won and that took my mind off the retirement and reminded me this is why I do this. It’s a big event, we raced all week and we needed every single one of us to be on. I couldn’t think of a better way to go out, not just because we won but how we raced. My whole family was on the hill, I didn’t know they were going to be out there, and that was really special. They are all quite emotional, but very special to have everyone come to see your last day of work. I just held it together but probably just because I was excited about the win for Daryl and that takes the mind off it. I really reckon it’ll be in a couple of week’s time before it registers. It’s been an emotional high all week. We needed everyone on, every day there was a plan, things to think about, so although I was being pulled in a few extra directions than normal, the number one priority was racing and it’s so nice to be able to race to the death." 10. Dries Devenyns (Bel) Deceuninck - Quick-Step. Wout van Aert (Cibel-Cebon) won the UCI World Cup Cross in Pontchâteau and took over the lead with just one round left to ride in Hoogerheide. The World champion out-sprinted Toon Aerts (Telenet Fidea Lions) and Michael Vanthourenhout (Marlux-Bingoal). The course for the World Cup cross in Pontchâteau is fairly easy with very little technical difficulties and fast. Despite a quick start of first David van der Poel - in the absence of younger brother Mathieu - and later Michael Vanthourenhout, there was a bunch of around 35 riders together at the end of lap 1. Sieben Wouters and Jens Adams attacked on the second lap, but it was Van Aert, who was looking for the win who did the work behind. Halfway through the race Lars van der Haar (Telenet Fidea Lions) fell on the stairs while in 5th position and held back the riders behind him. The Dutchman's mistake allowed Michael Vanthourenhout, Toon Aerts, Wout van Aert and Jens Adams take a 20 second lead. Adams worked hard to make the gap larger as Aerts and Van Aert kept a close eye on each other. After a while Lars van der Haar and Laurens Sweeck to get across the leaders. There were quite a few attacks, but Van Aert neutralized all the attempts. With one lap remaining Aerts made his move, Van Aert lost a few meters, but soon caught Aerts. On the final lap, Vanthourenhout managed to join them. The win was going to come down to a sprint; Van Aert hit the front first and no one could come round him before the line. Aert was close, but Vanthourenhout couldn't hold the pace to finish at 7 seconds. Van Aert took over the leadership in the World Cup from Aerts with the final race in Hoogerheide still to come. Van Aert by only 3 points on Aerts. European champion Mathieu van der Poel will also be in Hoogerheide. 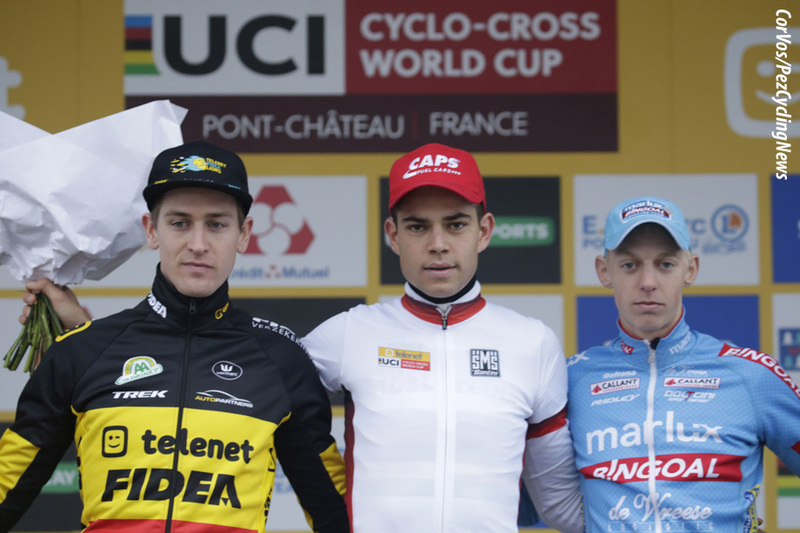 Race winner, Wout van Aert (Cibel-Cebon): "It is a relief to win here. Finally, this is a victory at the highest level. I am very happy with that. This course was very tactical. You have to stay calm and save energy for the final, but Toon did that too. I had to gamble on victory and respond to all attacks myself." 2nd, Toon Aerts (Telenet Fidea Lions): "Before the race, I said it was a tie in the final classification, but next week it is no different. It's nice that we can offer a fight. The cross is certainly not dead yet. I know Van Aert has a better sprint, so I had to get out of his wheel. On the stairs and the bars I thought I was a little better, but that was just a bit too far from the finish so you could hardly stay away." 10. Gianni Vermeesch (Bel) Steylaerts-777. 52-year old Andrea Tafi has not yet given up the hope of racing in the 2019 Paris-Roubaix, although he has still not found a team for the event. "This is not a joke, but a real goal. I train as hard as in my professional years," Tafi told Het Nieuwsblad at the Velofollies. "I hope to appear at the start" the 1999 winner said. The Italian announced in October that he wanted to ride Paris-Roubaix 20 years after winning the cobbled Classic. Tafi has spoken to Patrick Lefevere, but the Deceuninck - Quick Step manager couldn't give him a place on his team. He was also associated with Dimension Data, but they have not listed him on their roster. Olympic champion Greg Van Avermaet was at the first day of Velofollies in Kortrijk to show off his new Giant bike and to announce his participation in Kuurne-Brussels-Kuurne. Van Avermaet presented his new golden Giant TCR Advanced featuring the high points of his career. The Christ statue in Rio de Janeiro, the trident from Tirreno-Adriatico and a cobblestone from Paris-Roubaix. "After eight years on a BMC bike, there was a bit of adjustment to make, but at the first training camp I have been able to test the Giant sufficiently. The solidity and flexibility of the steering is striking. I am extremely satisfied with it," said Van Avermaet. The bike has a retail price of €10,000 (without pedals). Van Avermaet also has a golden helmet. "But I do not know if I will wear it during races. It's maybe a bit much?" 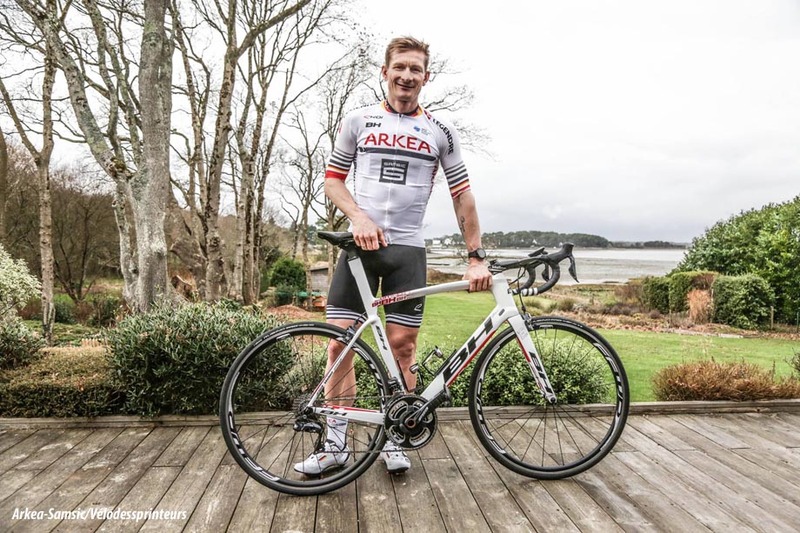 André Greipel starts in 2019 at the age of 36 with a new challenge with the French ProContinental team Arkéa-Samsic. The German, in a conversation with his new team, hints full of ambition: "I want to ride well in Paris-Roubaix and win a twelfth stage in the Tour de France." Greipel finished seventh place in the Hell of the North two years ago. "This is my favorite classic," says the sprinter. "I want to prove to myself that I can do even better than a seventh place. The Tour is a next goal, but I am aware that the team must get a wildcard for that. " Next week the German will start for the first time in the colors of his new team in Africa, where the Tropicale Amissa Bongo will be held. Der Gorilla is confident. "During the training in Morbihan last week, I saw the great potential of my team. The construction of the sprint train is progressing well, although driving against competition is of course a completely different matter. I have very good riders at my disposal and I look forward to showing it in the race," says Greipel. Aru: "I want to cancel 2018, one of the darkest moments of my career"
Fabio Aru had less than a good 2018 season and the Italian and UAE Team Emirates have been looking for answers. "We look too much at Wattages and testing, but to get those figures, you have to feel good and calm. I am finally in good shape again", Aru told La Gazzetta dello Sport. The new directors and trainers at the team are providing a new human approach to Aru's problems. "I like the new trainers", said the winner of the 2015 Vuelta. I’m getting along very well with the new staff and coaches. I like that the human aspect, serenity, is taken into consideration, even before preparation and performance..
Last year it turned out that Aru had problems with the absorption of carbohydrates and processing dairy products. Aru now tries to avoid dairy products, while limiting the number of carbohydrates per day. Coaches from the University of Colorado now follow the team. "We are followed by coaches from the University of Boulder, our head coach Iñigo San Millan has lived there for years. And, coincidentally, I had my first race in the pros, as an stagiaire in the Tour of Colorado 2012, I finished second in a stage", Aru said. "I do not want to talk about 2018 anymore; it was one of the darkest years of my career", Aru concluded. 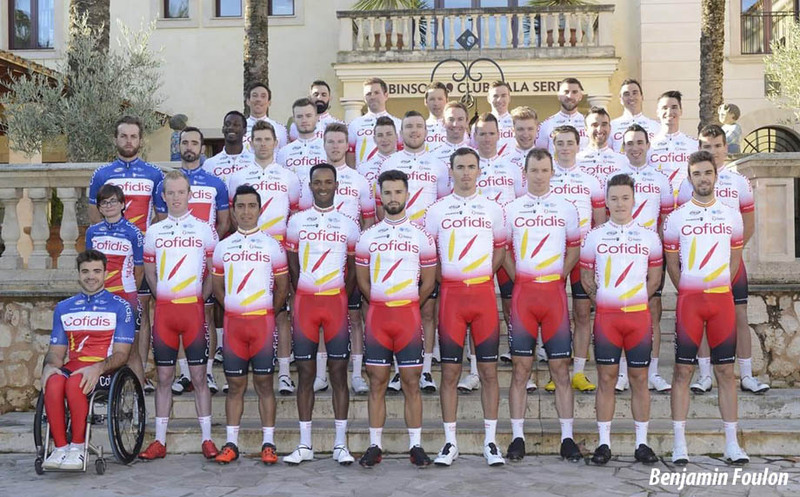 The French UCI ProContinental team Cofidis has expressed the wish to be part of the WorldTour in 2020. The French team had previously alluded to promotion to the top UCI level, but the sponsor and the team publicly announced their plans at the team presentation in Roubaix. "The decision to be involved in this project is great news," said team boss Cédric Vasseur. Until 2009, Cofidis was part of the top league of cycling, then called the ProTour. Since 2010 the team has been part of the ProContinental circuit. The team always received an invitation to the Tour de France, the Vuelta a España and most, if not all, ASO events every year. "We already have a number of WorldTour-worthy riders in our team", said Vasseur to L'Équipe. With the future and the WorldTour in mind, the Cofidis team tried to sign Warren Barguil at the end of 2018. The Frenchman had an ongoing contract with Arkéa-Samsic, which he wanted to respect. "The day that he is a free man, I will fight to attract him", Vasseur added. At the start of the new season Wanty-Gobert Cycling Team restructures its performance branch. The sportive leadership of the Wanty-Gobert cycling team remains in the hands of Hilaire Van der Schueren, assisted by Sébastien Demarbaix, Steven De Neef and Jean-Marc Rossignon. 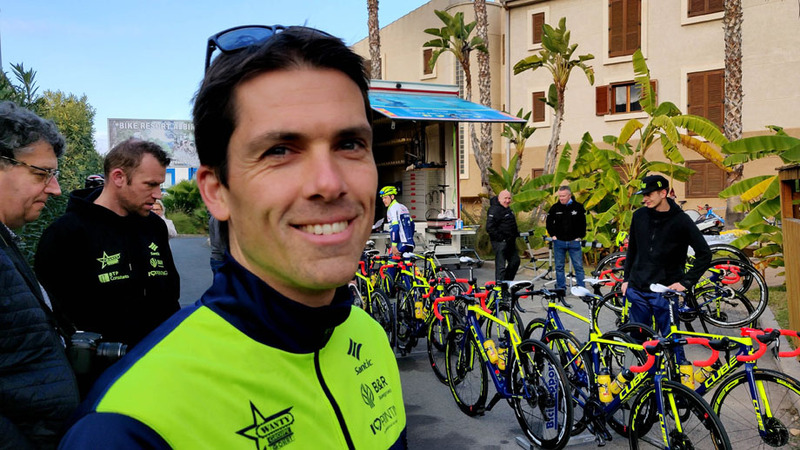 Frenchman Samuel Bellenoue has been appointed head of performance. Bellenoue joins ex-rider and trainer Frederik Veuchelen, who will also work full-time at the Belgian ProContinental formation. Former duathlete Bellenoue, specialized in altitude training, was previously active at AG2R-La Mondiale. Samuel Bellenoue: "I have been trainer of Guillaume Martin for five years. Through Guillaume I came into contact with Jean-François Bourlart. An important reason to join Wanty-Gobert is that I felt that the team is in a positive spiral. I also look forward to work in an international atmosphere. " "Three years ago the team started working with a trainer. I want to expand and strengthen this performance branch. Together with Frederik Veuchelen I plan and attend the training camps in 2019 and we will each follow up one part of the riders day by day. " "I am happy to work with Fré on my side. We complement each other well as a duo. I have more scientific knowledge, for example in terms of altitude training and time trials. Fré, as an ex-rider, has excellent course knowledge and wants to learn more about nutrition. In 2019 I want to extend my knowledge about performing in warm conditions." Jean-François Bourlart (manager): "Wanty-Gobert continues to evolve and make progress. In recent years we have been investing in the expansion of the medical and communication staff. Last year we started a collaboration with Frederik Veuchelen as trainer. We are now reinforcing that performance branch with the arrival of Samuel as head of performance." "This new performance duo has to optimize the condition of the riders. Thus we also want to meet the expectations of the UCI. We notice that the WorldTour teams focus strongly on performance. In order to reduce the gap with WorldTour teams Wanty-Gobert also wants to make progress in that branch." "In order to be well prepared for the crucial upcoming year, Samuel and Frederik are also working out the training structure at our twelve-day training camp in Alfaz del Pi (Spain). In addition, they will be present at the training camps and several stage races throughout the year, in order to follow up the riders closely." 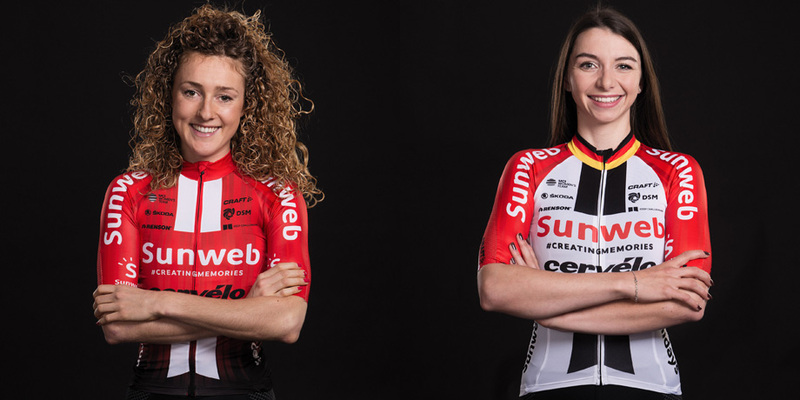 Team Sunweb are delighted to extend their contracts with the talented duo of Lippert (GER) and Mackaij (NED) until the end of 2022. The newly crowned German road race champion, Liane has gone from strength to strength in her development whilst in Team Sunweb’s ranks, securing a GC and stage win at Lotto Belgium Tour, amongst other top GC results through the 2018 season. "To sign until 2022 shows the trust the team has in me, they know my strengths and also where I can improve still," said Lippert of the extension. "I’m still such a young rider and I want to continue my development to become one of the best riders in the world, I believe this is the best place for me to do that. The team has already given me a leadership role within a race; to get this chance at such a young age is great and again shows their belief in me. I can’t wait for the next years together with Team Sunweb." "Liane is one of the rising stars in women’s cycling," added Team Sunweb coach Hans Timmermans (NED). "Last year she became German champion, won a four-day stage race and two WorldTour TTT’s. This is very special for a 20-year-old and we believe that the maximum of her potential is not even in sight. With our new Keep Challenging Center in Sittard we will have the opportunity to work closer with Liane, adding great value to the next steps in her development." One of the Women’s program’s long-standing members, Mackaij is a true part of the team’s core. As well as being a real team player, 23-year-old Mackaij is more than capable of going for a result herself. In 2018 she took two impressive stage wins at the Tour de Feminin, a win at Omloop van de Westhoek, finished in 2nd place at Le Samyn des Dames and 3rd at Dwars door Vlaanderen. "I’m really happy with my new contract for the upcoming seasons," said Mackaij of her extension. "I’m very proud to have been a part of the team since I was a junior. Team Sunweb suits perfectly with my personal development and together I want to take the next step up to the top level of women’s cycling." Hans Timmermans concluded: "Every year Floortje makes a step forward. She has a bright future ahead of her and I am confident that we will see her more often in the finals of WorldTour races – she was close to that level last year already. At the end of last season she had a lot of bad luck because of a hard crash in training, but here she showed how impressive her mental strength is which is just as important as any physical capability. We’re looking forward to continuing working with Floortje, it will be great to see where her development leads." Can you ride with a pro team? Go with Oz Cycle on a ride with the Deceuninck - Quick-Step team and see how they train for the lead-out for Elia Viviani.